Here, on the corner of Fourth and Locust (Main St.), we have one of Fairbury’s historic buildings whose interior has been converted into a very unique eatery. As you walk into the facility you will find descriptions, memorabilia, and information concerning the previous occupants of this old time brick structure all done and arranged in a comfortable atmosphere of specialty dining. 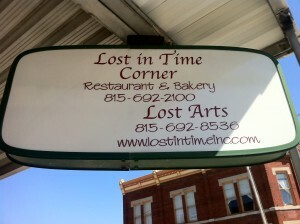 Lost in Time was created by a hometown Queen of Cuisine who has a long standing affection for local history as well as a love for cooking and baking. She has brought this concept to life with an innovative breakfast and lunch menu that provides a variety of palate pleasing entrees that are literally made from scratch. The restaurant’s kitchen uses many main ingredients that come from local farms and gardens. In addition to daily specials, their menu has a whole host of regular customized items, from breakfast staples and specialties, to soups, salads, sandwiches, and desserts, all designed and prepared to redefine the cliché of “standard issue”. Going a step beyond the breakfast and lunch venue, the fine dining reputation they have acquired is extended to include dinner on Monday evening featuring a special full meal item, as well as having the regular menu items available. In addition to the restaurant there is a very stable supporting cast of operations that include a rather exclusive Timeless Treats Bakery which offers an endless list of baked goods and condiments that include (but not limited to) homemade bread, rolls, cookies, pies, jams, salsa, fudge and noodles along with made to order items. Also, directly west across Fourth Street, is the Lost Arts retail facility which carries items handcrafted by local folks and supplies for quilting, knitting, crocheting, tatting, needlework and sewing. A nice representation of these “artsy” items is also available in the restaurant itself. The restaurant and bakery complex has an additional adjoining building that can be reserved for private parties with access to all the same amenities that have proven to be exceptional in the eyes of public opinion. So, come on uptown (or downtown if you prefer) and see what everyone is talking about – you can experience a bit of Fairbury history from the displays and the staff as well as enjoy a unique dining experience. The hours are Monday from 7am to 8:30pm and Tuesday through Saturday 7am to 4pm. The bakery is open 6am to 5pm Monday through Friday and 6am to 4pm on Saturday. The retail store runs from 9am to 5pm Monday through Friday and 9am to 2pm on Saturday. See you there and if you end up too full to enjoy dessert just get it to go, they’d by happy to fix it up for you.